We are delighted to announce that M Taher & Co has again been recognised as one of the UK’s leading shipping firms in the 2016-17 edition of the Legal 500 directory*. Sources describe M Taher & Co as delivering “an excellent service” to its shipping clients and praise Maryam Taher for being “an outstanding lawyer; commercially minded, with deep knowledge of the industry”. 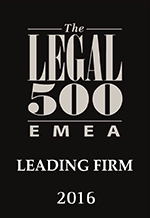 *The Legal 500 provides the most comprehensive and reliable worldwide coverage on recommended Law firms, Lawyers, Attorneys, Advocates, Solicitors and Barristers.